Sin Tat Mon village in Myanmar's Rakhine state. Thousands of Kaman, ethnic Muslims who are citizens of Myanmar, remain displaced in Rakhine state, unable to return to their homes or have their say in the country's November elections. SITTWE, Myanmar: On an isolated island, accessible only by boat from Sittwe on the Myanmar mainland live thousands of Myanmar citizens living in abject poverty and denied the right to vote in the upcoming general elections. The reason: Their Muslim religion. 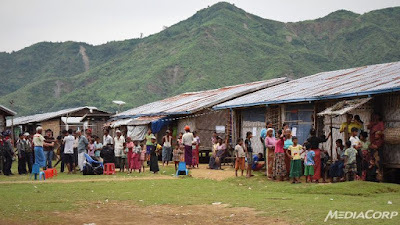 In Sin Tat Mon Village, about 7,000 Rohingyas, known as Bengalis by the Myanmar government, live alongside a small refugee camp that houses more than 2,000 Kaman, Myanmar citizens who due to their faith were victims of deadly violence in 2012 and have yet to recover their former lives. 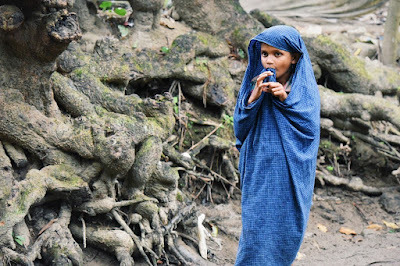 Kaman people are officially recognised by the Myanmar government as one of the seven ethnic groups in the country and hold strong historic and cultural connections to these lands. Their ancestry stretches back several centuries and they are widely considered indigenous. They hold national identity cards, what should be a powerful symbol of citizenship in the country, yet they claim their rights have been slowly eroded in the aftermath of deadly riots in 2012. A group of 4,000 people from the town of Kyauk Phyu fled in terror from the violence then, undertaking a two day boat journey to Sittwe, where they were refused access to port. 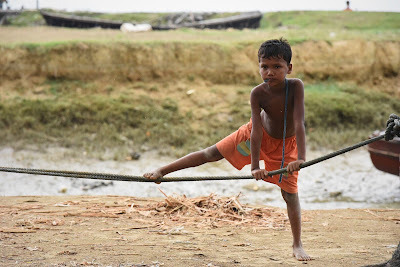 They then settled on the island, living among the Rohingyas before a internally-displaced persons (IDP) camp was established months later. Today, the camp, with the support of the state government and international NGOs, has vastly improved from its founding days. Wooden structures have replaced tents, women have areas for breastfeeding and chickens for eggs and food run freely through the muddy laneways. But this is far from home for the proud Kaman people, who cry out desperately for healthcare and a political voice to stand up for their community. Kyaw Hia is a community leader who once ran as an election candidate for the ruling Union Solidarity and Development Party (USDP). Now he is in a fight with them to restore voting rights for the Kaman. "In previous elections we could vote, since 1974 and even in 1990 and 2010," he said. "Other camps have voter lists but here there is none so we sent a letter to the president but we are still waiting to hear back." 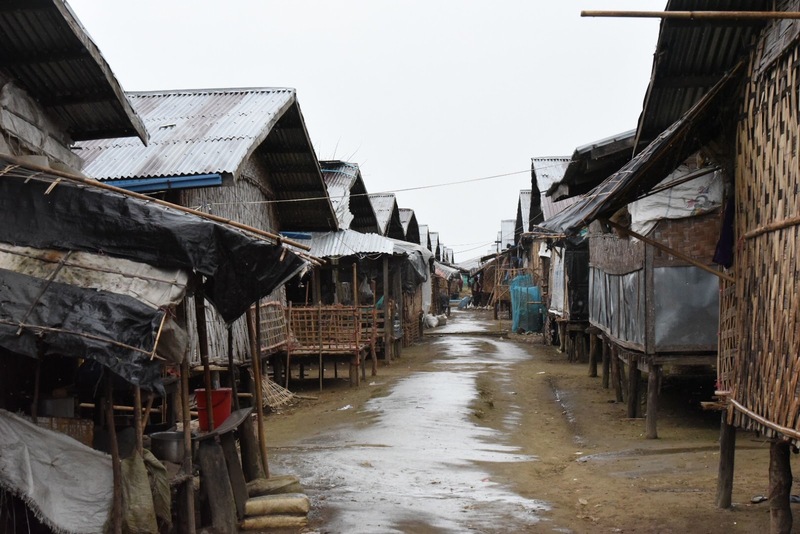 In the meantime, the Kaman have no freedom of movement and are restricted to the displacement camps, as the Rohingyas are to their village. Kyaw Hla said the community has "no hope" of any outcome soon. "We are expecting that after the election there will be a new government, so we are waiting to see." Ohn Mar Saw's husband died last year and she said health care remains a major issue for displaced Kaman. His sister, 49-year-old Ohn Mar Saw lost her husband in 2014 to illness and she has been left with her two children in the camp. Her eldest lives in Singapore, working in the shipping industry but she will not allow him to return to Rakhine. "I have told him not to come back," she said. "At any time there could be riots. But we stay in touch using Viber." 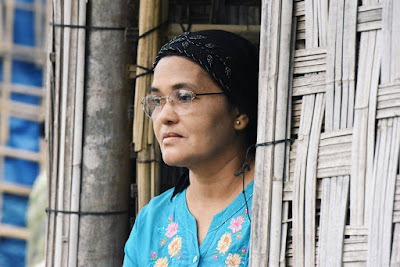 "We are people of this country, I have a national identity card but I cannot go to Sittwe if I want," she said. 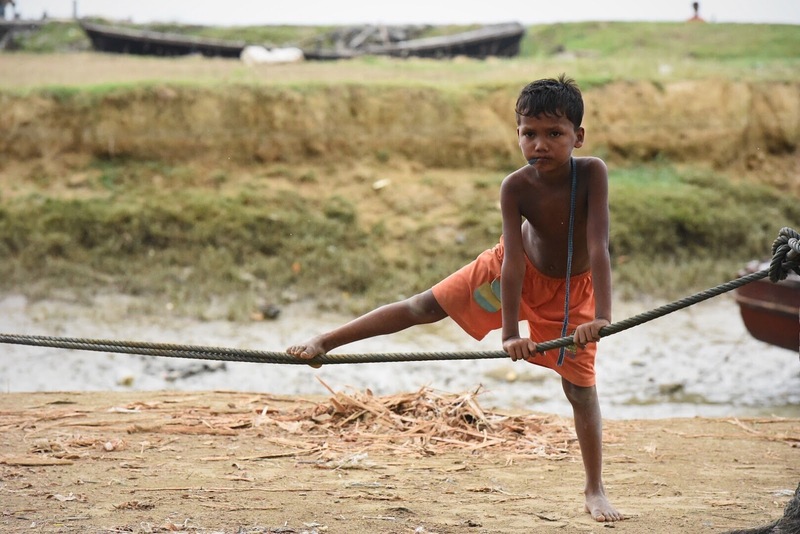 "Children here need school and university. And people are dying here." Health is a major concern for many residents, including Ohn Mar Saw, who works as an interpreter for Medecins Sans Frontieres when they visit the camp each week. She also helps with advocacy programmes to help maintain hygiene around the camp, which has limited drainage and sanitation. Police with rifles monitor activity at the camp and prevent people leaving the island. Ever present around the population are police officers who oversee everyone entering and leaving the area and maintain strict order. They witness all interviews and record what is said to visiting media. 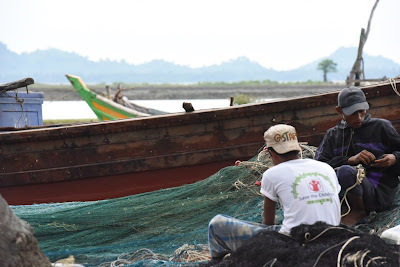 Fishermen mend their nets in Sin Tat Mon village. Around them, children play in the steady rain, many suffering from malnutrition and visible skin ailments. Men sit and tie fishing nets as the tide sweeps out; they will need to pay police to attempt a catch each day. Along the shoreline, empty shells of two-storied buildings are unused, there is no-one to staff a clinic or a school should it be completed. A makeshift mosque is a place of pride for many here; back in the home towns of Muslim communities, mosques have been destroyed and decommissioned to be used as housing for soldiers and police. Returning back there is a distant prospect with a lack of security and fear of future reprisal major considerations for the Kaman even if the government was to lift travel restrictions. 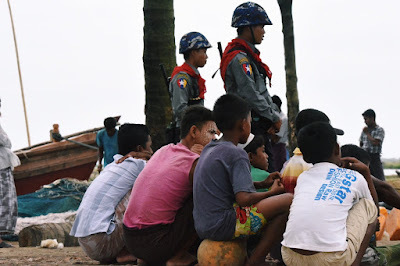 "We are suffering because of this," said a resigned Kyaw Hia. "It is the fate of our people."